This product is no longer available and has been replaced by: AM16/32B. The AM416 was replaced by the AM16/32 in 2001; replacement parts remain available (see Ordering Info). The AM16/32 was later replaced by the AM16/32B. The AM416 multiplexed up to 16 sets of 4 lines at a time. It was suitable for thermistors, potentiometers, load cells, strain gages, vibrating-wire sensors, soil moisture blocks, soil water content reflectometers, etc. Thermocouples could be multiplexed with the AM416 although our AM25T multiplexer was designed specifically for this purpose. 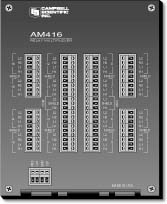 Depending on sensor type, the AM416 typically multiplexed 16, 32, or 48 sensors. As a general rule, up to six multiplexers could be connected to a single data logger. A series of data logger instructions control AM416 operation (measurement instructions that are repetitive are generally contained within a programming loop; in CRBasic data loggers, this functionality is available in the SubScan instruction). SCWIN software (available free of charge from our website) supports simple programming and generates wiring diagrams for AM416 applications.